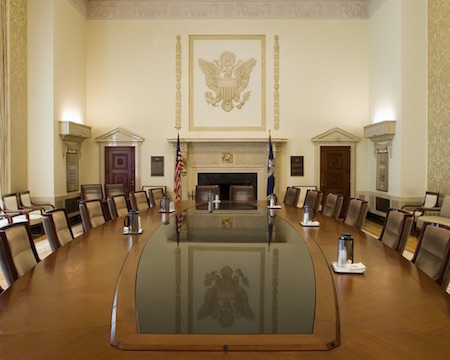 Federal Reserve officials like to say their policy course is �data-dependent.� That sounds very cautious and intelligent, but what does it actually mean? Which data and who�s interpreting it? Let�s ask a few questions. First, how could their policy choices not be data-dependent? The only alternatives would be that they made decisions randomly or that there was an a priori path already determined by previous Fed policymakers that they were forced to comply with. A predetermined path would, of course, eventually be leaked, and then everybody would know the future of Fed policy. Until they changed it. Of course, they do depend on data, and lots of it, but are they looking at the right data? If it is the right data, theoretically speaking, is it accurate? As we will see, more often than not they are basing their decisions on data created by models that rely on potentially biased assumptions derived from past performance, etc. Often the data they look at is actually a sort of metadata, a kind of second-derivative model, with all sorts of built-in assumptions, quite removed from the actual data. That approach is actually reasonable when you realize that the amount of data that must be managed is simply too large for any human being to process in a coherent manner. The data has to be massaged, and that means making assumptions that create the models in the programs. Those are assumptions are not made by computers, they are made by human beings who are doing the best they can � using models based on assumptions they build in to guide them as to what assumptions they should make about the data. Convoluted? Yes. I certainly don�t know all the answers to the problems with national and global economic data and metadata management, and it�s far from clear the Fed knows those answers, either. Whatever your economic and political ideology, we can all agree that these are big problems. Today we�ll look at how big. First, a quick update on the Strategic Investment Conference. This is especially for the many of you who wish you could attend but have conflicts. For you, we have something new: the SIC Live Stream Virtual Pass. Video coverage for all the conference sessions will be streamed live over the internet straight to your computer or mobile device! It�s not quite like being there, but it�s darned close. The technology to do this is quite expensive, as you may imagine. We�re making the investment because this year�s message is so important. Our theme this year is �Crossroads� because that�s exactly where the world is. We are at an inflection point and have big choices to make. Right ones will speed us along. Wrong ones could slow us nearly to a halt. We are actually approaching multiple crossroads simultaneously. You know the list: In addition to the Fed, other central banks are on the cusp of big policy shifts, too. Geopolitical challenges are cropping up everywhere, and some big emerging-market countries are on shaky ground. We�ll be exploring those crucial issues and more at SIC with 25+ top experts. If you can�t join us in San Diego, the Live Stream Virtual Pass will bring the conference to you. You�ll see all the sessions and even be able to submit questions to the speakers. I�m doing this because I want every reader to have every opportunity to get ready for what�s coming. The SIC Live Stream Virtual Pass will be your ticket, and at a very reasonable cost. If you suffered, learning how 25 of the world�s top money managers and investment strategists are positioning their portfolios for the road ahead could save your portfolio from further losses. Watch them live March 6�9! Here�s a garden-variety mainstream media market narrative right now. I made this up, but similar thoughts are voiced everywhere. US growth is finally taking off after years of stimulus. We�re near full employment, and wages are starting to rise. Consumers are opening their wallets just as tax cuts and deregulation embolden business to expand. At the same time, we are hitting resource constraints that have the economy close to maximum output. The resulting concern about inflation is pushing interest rates higher and taking some froth out of the stock market. � We�re nearing full employment. Are those statements correct? How do we know? How do we even define full employment and maximum output? Measuring them isn�t like sticking a thermometer in your holiday prime rib to see how it�s cooking (which, by the way, if you are serious cook, you absolutely must be doing). Recent events have exposed a hole in the middle of economists� knowledge of key economic parameters: We know neither the unemployment rate at full employment nor the potential level of gross domestic product (GDP). That hole is particularly important right now. The combination of the deficit-financed tax cut and the new spending bill are pumping hundreds of billions into an economy that many argue is already at full employment. If so, then much of this extra spending won�t lead to new investment, jobs or higher real pay. When the economy�s human and capital resources are fully utilized (meaning actual GDP is equal to potential GDP), fiscal stimulus just generates inflation and higher interest rates. Even if the extra demand might create some wage pressure, it will be met with higher inflation, so real wages � the paycheck�s actual buying power � won�t change at all. 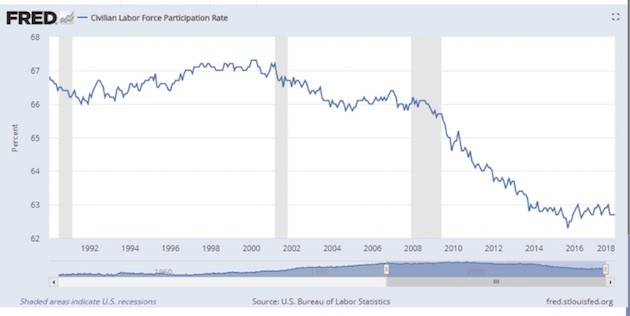 The problem is that those making that argument are implicitly asserting that they know that the �natural rate of unemployment� � the lowest rate consistent with stable inflation � is roughly equal to the current unemployment rate. That is, they believe we�re at full employment. But the truth is they have no way of knowing that, and one key indicator � inflation � suggests they may be wrong. Those are three paragraphs that I could have written and defended. I think that fact is significant. Jared and I more than likely to disagree on what economic policies we should follow � but we can�t even have that argument until we can agree on what the data says and means. And we can�t at this point. We have to rely on anecdotes and hints, at best. This state of affairs is startling once you start thinking about it. Economists are reaching conclusions and policymakers are making decisions based on derivatives of invisible derivatives. Sound crazy? Yes, but it�s happening. Let�s talk about these two stats, full employment and potential GDP. They have multiple layers. �Full employment� means all the people who want to work are gainfully employed. For the record, the Fed thinks that full employment is an unemployment rate of about 4.7%, while the BLS tells us that unemployment is currently running at 4.1%. Those who aren�t working are either in between jobs or face some barrier, like a criminal record or lack of skills. Therefore, if we are indeed close to full employment, employers who need more help must offer higher wages, which leads to inflation. At least that has been the pattern historically. But is it really that simple? In any given month, we have only a rough approximation of how many people are unemployed and an even rougher idea of how many might become employed but are currently not even looking. The numbers come from survey data, with all the inherent limitations surveys entail. There are actually two different federal surveys, and sometimes they disagree wildly. Over time they get in line, but on a month-to-month basis? Not so much. Beyond those surveys, what we think we know is mostly conjecture and assumptions about what we want the data to say. For instance, simple observation and the actual surveys suggest that many Americans, while nominally employed full-time, aren�t earning as much as they once did. Nor are they as productive as they once were or as they could be. If that�s a widespread pattern, it means the economy still has �slack.� Production could rise significantly without adding any new workers. What we have is not �full employment� in any real sense. We use survey data to infer how many people are employed, how much they are paid, and so on. In the process we observe people who aren�t employed. We try to figure out why they don�t have jobs and what circumstances might bring them back into the labor force. It�s a many faceted mystery no one has solved, yet we make important policy decisions based on our fragmentary understanding of that mystery. Let�s look at a few different ways to measure what we mean by full employment. The Bureau of Labor Statistics (BLS) suggests that if you haven�t been looking for a job in the last 30 days, you are not in the workforce. Thus you don�t count as unemployed. First off, that way of defining unemployed runs contrary to all of our personal experiences. There are lots of people who have not been able to find a job and have given up looking, but if they were offered a decent-paying job they would take it. Choosing to say that they are no longer in the labor force after just 30 days of not looking seems rather arbitrary and unrealistic to me. 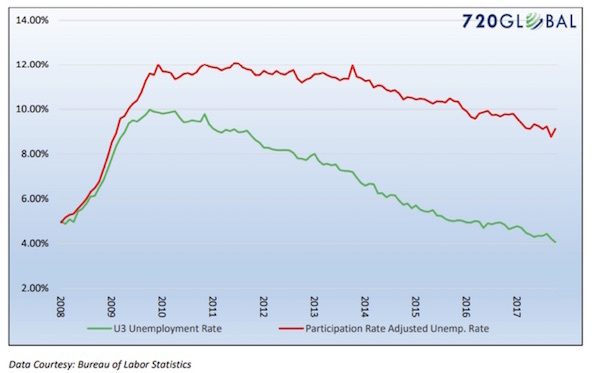 My friend Lance Roberts (via Michael Lebowitz) adjusts the unemployment figure based upon a methodology that includes the people who have quit looking for jobs. He compares that adjusted rate to the U3 rate in the chart below. Is Lance�s number the real employment rate? I would suggest that it�s not, because a lot of people who are not in the labor force really aren�t looking for jobs. They are students, or they are on disability, and so forth. Lance performed the exercise to make us think about the employment numbers. For there to be demand-led inflation, consumers need to actually have some of that wage growth in order to be able to spend more money. Yet real savings as a percentage of disposable income is down to just above 2%, a long way from the long-term average of 8%. And credit card debt is still rising while disposable income is flat. The first graph below shows the traditional Phillips curve as typically displayed (U-3 and recent three-month wage growth). 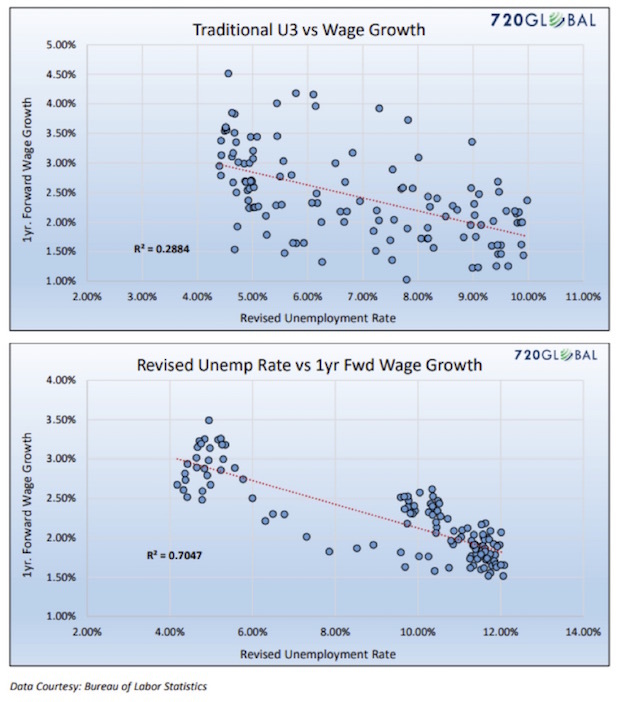 The second is a modified Phillips curve which uses the revised U-3 from above and one-year forward wage growth. Both graphs � demonstrate that only 28.84% of the change in wages was due to the change in the unemployment rate. 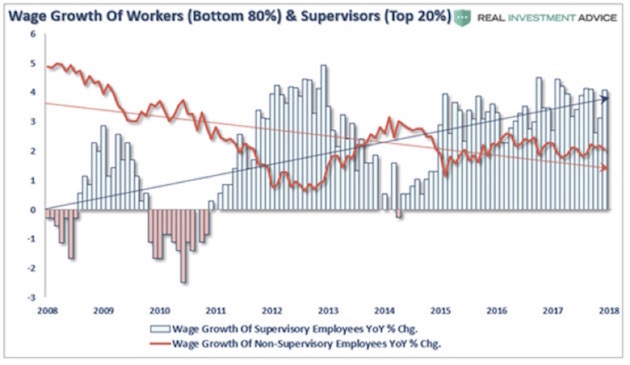 Visual inspection [of the first graph] also tells you the relationship between wages and unemployment is weak. 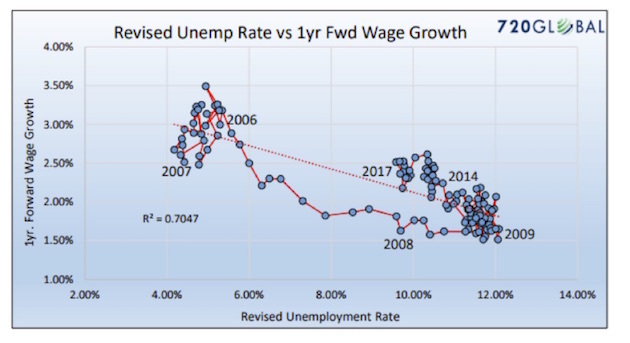 It is this graph that has many economists declaring the Phillips curve to be irrelevant. The second graph has a (warning: economic geekspeak) statistically significant R� of .7047 and a visible confirmation that the Phillips curve relationship continues to hold. Recently, Federal Reserve Bank of Chicago President Charles Evans stated, in relation to the Phillips curve, �We don�t have a great understanding of why it�s gotten to be so flat.� Mr. Evans, perhaps employment is not as strong as you and your Fed colleagues think it is. If one believes that the laws of supply and demand continue to hold true, then the revised Phillips curve graph above argues that the unemployment rate is in reality much closer to 9% than 4.1%. To believe that the Phillips curve is useless, one must be willing to ignore a more rigorous assessment of labor market and wage data. The only reason economists and Fed officials voluntarily ignore this data is that it belies the prettier picture of the economy they wish to paint. Does anyone else see a problem here? Those who crunch the data see what they want to see and disregard the rest. If you want to see low unemployment, you find data that gives you low unemployment. You don�t look at contrary measures. The Fed has taken this position in spite of the fact that most Fed economists truly believe in the Phillips curve. They just don�t believe in it enough to take it to its logical conclusion, as 720 Global did. We then use this estimated GDP, this fuzzy and incomplete growth measure, to infer potential GDP, or how high this nebulous number could go if some of its inputs changed. Then we wonder how close we are to this vague derivative of an incomplete measure of a hypothetical construct, so that we can modify fiscal and monetary policies. It�s important to understand that if we have in fact now begun to exceed our potential GDP, then economic theory suggests that inflation � and perhaps not even mild inflation � is right around the corner. I am not a doctorate-holding economist, but to me this seems an unwise assumption to make. It�s true that influential institutions such as the Federal Reserve and the Congressional Budget Office (CBO) believe that the �natural� unemployment rate is above the current one, meaning our labor force is beyond fully employed. Their estimates are 4.6 percent and 4.7 percent, respectively, while the actual rate is 4.1 percent. The CBO also asserts that our current level of GDP � $19.7 trillion � represents full capacity. But the evidence undermines much confidence in these authoritative-sounding point estimates. First, understand that neither of these measures � the natural rate or potential GDP � can be observed. They must be estimated based on the movements of other variables. For example, the key relationship underlying the natural rate is the one between unemployment and inflation, with the basic insight being that once economic capacity is exhausted, any more demand just shows up as more inflation (note the link between the debate over fiscal spending right now). This is a key point. No one can directly observe the natural unemployment rate or potential GDP. �They must be estimated based on the movements of other variables,� Bernstein says. Much of our economic data is similarly inferred. Astronomers can look into the heavens and infer that planets they cannot see are revolving around stars they can see. They can do this because they understand with some precision how gravity works. Moreover, gravity doesn�t sometimes work differently because people wish it would. Wile E. Coyote kept learning this the hard way. Economics enjoys few such certainties, even though many economists think it does, or at least wish it did. This brings us to the present market conundrum. Is the economy close to overheating, or not? Perfectly sincere people look at the same data and come to radically different answers. That wouldn�t happen if economics were a hard science. We would apply the data to known laws and the correct answer would be obvious. It isn�t obvious at all, but policymakers act like it is. I�m not saying we should go to the other extreme, doing nothing until we have 100% certainty. That�s not wise, either. The key is to recognize that we have blind spots and then work around them. For instance, physicians don�t know everything (certainly not as much as we like to believe they do) about the human body, but they make good use of what they do know. The lab tests show an infection, and they treat it; the CT scan shows a suspicious mass, and they remove it. Would you let a doctor cut you open based on data as reliable as, say, GDP or unemployment? Of course not. That would be crazy. And your doctor would probably agree, because the Hippocratic Oath says �Do no harm.� Economists have no such oath. Maybe they should. Airplanes are an even better example. Your pilot delivers you to your destination safely thanks to extensive, accurate data on the plane�s course, altitude, speed, and so on. Now imagine a plane in which Federal Reserve staff had filled the cockpit with instruments meeting their standards. Would you get on that plane? Let me think for a nanosecond. No. I would not board such a plane because I would have zero confidence that it was taking me to the right city. A San Francisco flight could easily end up in Cleveland � if it arrived anywhere at all without crashing. Believing that the data they have is precisely meaningful gives people like Federal Reserve governors the mistaken impression that they have what they need to manage the economy successfully. They don�t. They have lots of data and not so much information. Our best move is thus to admit the uncertainty, toss the point estimates, and follow the data, particularly inflation. Recognize that we�re driving a car with no reliable indicators of engine overheating, so we�ve got to use our eyes and ears to gauge the heat. That doesn�t call for recklessly pumping the gas or the brakes. It does call for more humility about the limits of our knowledge. Having �more humility about the limits of our knowledge� would be an excellent step toward more rational monetary policy. Will the Powell Fed take that step? I hope so� but I�m not holding my breath. Think about this: 12 people sit around a table, chew the fat over masses of data and metadata, and then set the price for the most important commodity in the world: the US dollar, the world�s reserve currency. How do they know they�re right? Well, they tell us confidently, it�s all in the data. If the market is competent to set long-term rates or LIBOR, then maybe we should trust the market to set short-term rates. That doesn�t mean there would be no role for the Fed. There are points in the economic cycle when the Fed can be quite useful, typically during a liquidity crisis that follows hard on the heels of too much irrational exuberance. Want to have some fun? Read this at the Financial Times Alphaville site. A former Fed insider recounts the debate at the FOMC meeting when the committee was trying to implement QE3. It�s hilarious in a sort of �Oh my God, it can�t really be this bad can it?� way. Not exactly confidence-inspiring. And yes, I�ve talked with lots of people who have been �in the room,� and it can get that bad. And yet the chairman of the Federal Reserve comes out after the meeting and confidently announces whatever the policy decision is, not mentioning the questions and disagreements and uncertainty and frustration of the members who sat around the table. By the way, these FOMC meeting minutes are not released for five years. I guess that�s because the parents don�t want to let the children hear them arguing. And with that I will hit the send button. Technically, I should have spent a good deal of time talking about inflation and the CPI in conjunction with this question of the analysis of data, but the letter is long as it is. Next week we will spend the entire time talking about inflation and the assumptions we make about it. That�s an exploration I look forward to sharing with you. I will be meeting with Mauldin Solutions business associates Sunday night through Monday night; then Tuesday morning I�ll fly off to San Francisco and then drive up to Sonoma to be with my friends at Peak Capital Management for their annual client conference. It will be a fun conference, as I have a lot of friends flying in. I�ve been wanting to spend some quality time with them. Peak has graciously allowed me to stay a few days, and I am going to bookend their conference. After that conference I am home for a week to nail down my presentations at the Strategic Investment Conference in San Diego. I mentioned at the beginning that we are doing a video live stream of the conference. Some of the links we used when first sending that information out did not work. I am assured that this one does: SIC Live Stream Virtual Pass. It�s the next best thing to being there. By the way, I didn�t mention it above, but you will be able to go online and ask questions and vote on the questions that those in the room are asking. We are doing everything to make the Virtual Pass as close to the real thing as possible. Sidebar: It happens every year. This is our 15th conference, and for the last seven or eight in particular we have gotten a lot of people who should be on the stage signing up at the last minute. Last year and this year I kept a few sessions open, waiting to see who would show up that I should ask to join us as presenters. But no sooner had we finally �pulled the trigger� this year than we had several people sign up that I wished we had on the stage. Oh well, maybe next year. But for those who are attending, I will point them out from the podium so you can catch them at breaks and dinners.